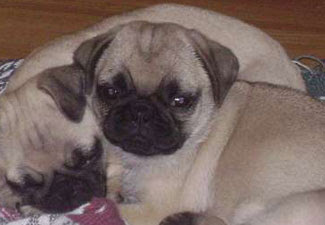 Breed Group: Toy Weight: 6-8kgs Height: 30-32 cms Color(s): apricot/fawn, or black, Age group: 6-8 weeks Coat: The Pug has a very fine, short, and soft coat. Distinct feature: Black muzzles with proper wrinkles in the forehead and two and a half fold curvations of tail. Nose is punched inside the wrinkles Temperament: The Pug is a happy and cheerful little fellow that gets along with just about anyone. Activity: Pugs are lively little dogs, however they are relatively active indoors and do well without a yard. This breed does love long walks.